LCD Graphic Shield Plus Temperature Sensor! This shield is one of the new toy in my recent DFRobot shipment. Being a display shield, it has to be positioned top most. Otherwise, how to see the display? So there is no standard top shield connector provided. Instead, an array of 3 pin male connector can be found on top of the shield. Upon closer inspection, this 3 pin connector can be used to connect DFRobot sensors. This is where things get exciting. Anyway, I planned to blog about the sensors too. Now both LCD Graphic Shield and sensor can be tested and blogged about in one article! Please note that there are two type of sensor in DFRobot standard sensor set. Analog sensor and digital sensor. Connectors for digital sensor are on top left corner, while for analog sensor are in the bottom right corner of the shield. It is a row of three pins. The first pin are the sensor output, which can be analog or digital. The other two pins are VCC and GND. It might not be obvious initially, but they both require different type of cable. Due to pin out configuration that switch between VCC and GND. For Analog sensor, pin 1,2 and 3 are respectively Signal (S), Ground and VCC. For Digital sensor, the pin 1,2 and 3 are respectively Signal (D), VCC and Ground. So a common pitfall (happen to me!) is to use digital cable with analog sensor or vice versa. Which will not work! Here is pictures of digital and analog cable. Also picture of LM35 Linear Temperature Sensor which is an analog sensor. Hence pictured using analog cable. Click the picture for larger view. Analog sensor using analog cable. Stack the LCD Graphic Shield on top of an Arduino board. In my case I use Uno, the latest basic official Arduino board. Connect LM35 Linear Temperature Sensor to analog input 5. Make sure pin 1 is S, pin 2 is GND and pin 3 is VCC. Connect Arduino board to the PC or notebook using USB and un the Arduino development environment. Don't forget to set the appropriate COM port and board type. 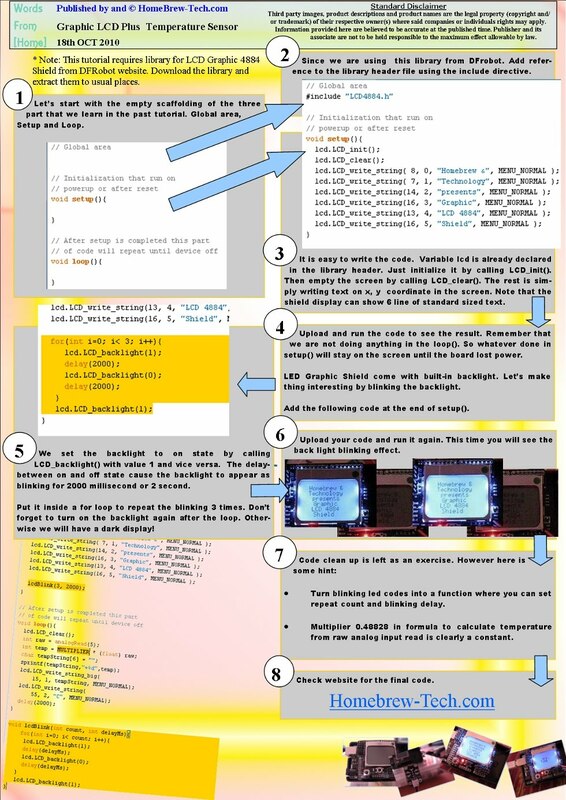 The rest is coding which we will go through in picture tutorial bellow. In the mean time, enjoy this video showing the display output. Help to visualize what is going to happen! *NOTE* : Stay tuned for the next part. Where we will demonstrate the simple code to bounce the temperature reading around and add RTC chip and turn this temperature display to temperature display plus clock! Here is the next part!